Glasgow Defence Campaign: Resisting Militarism: Solidarity with the Finnieston 4! 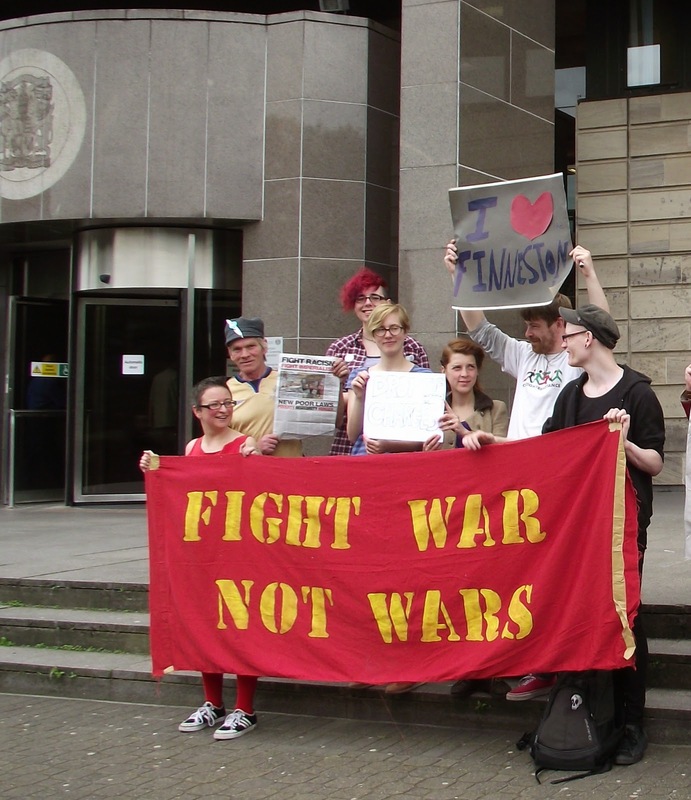 Resisting Militarism: Solidarity with the Finnieston 4! The GDC expresses its full solidarity with the four anti-war activists arrested and charged for unfurling a ‘Resist Militarism’ banner from the Finnieston Crane on 28 June, Armed Forces Day. We urge all our supporters to send messages of support to whitefeatherclubglasgow@gmail.com and join all future court protests. Here, a GDC supporter looks at the growing trend towards normalising militarism and repressive policing, and the real role of the Commonwealth Games. You’d think they were trying to tell us something. Britain’s national event for Armed Forces Day this year was held in Stirling on 28 June. As it happens, purely coincidentally, Stirling was chosen as host city at the same time as it would hold events to mark the 700th anniversary of the Battle of Bannockburn. The Princess Royal, alongside Prime Minister David Cameron, Leader of the Loyal Opposition Ed Milliband, and Alex Salmond, were on hand to oversee the carnival of reaction: service parades, ‘exciting military demonstrations’ of Apache attack helicopters and Red Arrow fly-bys. As families looked on, the very same day, these instruments of death were being put to other uses, as the IDF pounded artillery shells into Khan Younis and wounded seven Palestinian children and a pregnant women. A month later, the Red Arrows were back in Scotland, flying over Glasgow to mark the opening ceremony of the Commonwealth Games as Her Royal Highness shuffled around Parkhead, God Save the Queen was sung and presumably, teary-eyed, the Chief of the Armed Forces looked longingly over the remnants of the colonial empire she once proudly headed. As independence looms, the British establishment, and its willing toadies in the City Council, seem keen once more to present Glasgow as a loyal city of Empire. As the artillery rolled through Stirling, the same day four brave female anti-war activists scaled the Finnieston Crane in Glasgow to protest against the glorification of war on Armed Forces Day. A huge banner was unfurled that read ‘RESIST MILITARISM #whitefeather’. The Glasgow Defence Campaign salutes this imaginative and brave act of dissent. Speaking from the top of the crane, one of the protesters, Friday Grey, said: ‘When children in Scotland go to see tanks and bombs today in Stirling, that’s part of the normalisation of military culture.’ Actions and protests such as this are crucial in disrupting that culture. Supporters of the GDC will be familiar with the concerted attempts at Police Scotland, and its predecessor Strathclyde Police, to harass, undermine and criminalise any expressions of opposition to war and militarism in Glasgow. In the past week alone, supporters of Fight Racism! Fight Imperialism! (FRFI) organising solidarity with Palestine have had streets stalls disrupted and public meetings visited by uniformed police officers demanding information. The four activists appeared in court on 30 June, with the GDC joining the supporters who gathered inside and outside the Sheriff Court in solidarity. The four women all pled not guilty and were released on bail with the next court date set. In a significant development, however, the Crown initially tried to impose bail with ‘special conditions’ preventing the accused from entering what they termed the Commonwealth Games ‘events zone’ which included over a dozen areas of the city and the entire Marathon route. As the judge, who struck down the attempt, commented, this would have meant the accused being unable to leave their homes and going to their places of work, study and other locations. All this over a breach of the peace charge and a protest that had nothing directly to do with the Commonwealth Games. The attempt by the Procurator Fiscal to deploy the Commonwealth Games as a factor in the treatment of the arrested activists confirms another point made by the GDC, the Glasgow Games Monitor and anti-ATOS campaigners over the past two years: that the Commonwealth Games is being used as an excuse to clamp down on dissent, extend increasingly repressive policing, normalise the deployment of armed soldiers on the streets and destroy any opposition to the corporate interests which dominate both the Games and Glasgow itself. The case of the Glasgow Against ATOS 2 – FRFI activists arrested and charged for speaking on a megaphone against the Commonwealth Games sponsors – and the recent arrest of an anti-ATOS activist during the Queen’s Baton relay in Barrhead are just two examples. The latter was banned from entering any Games venues for the duration of the event. To borrow from the marketing jargon of the Games organisers, this will be one the key ‘legacies’ of the Commonwealth Games. This huge security operation will not melt away after the Games. Like Armed Forces Day, its role is to normalise the apparatus of repression, of armed police and soldiers on our streets. Its real target is not some anonymous ‘terrorist threat’ but the protesters, activists, and in the end, the working class communities of Glasgow who may dare to raise their voices in opposition to the endless violence of the British state at home and abroad. Defending the right to defend Palestine!